In an effort to avoid putting so many miles on my truck and also just to get better gas millage, I bought a new 2013 Honda Civic. It took a bit of searching but I managed to find one with a manual transmission which I felt was necessary to avoid becoming bored with driving the car. Of course I had just finished setting up a nice audio system in the truck and now I’m driving around in this new Civic with a factory stereo! That just wasn’t going to work! So, I went to Electronic Warehouse in Queensbury, NY just across the street from D’ella Honda where I had purchased the Civic. 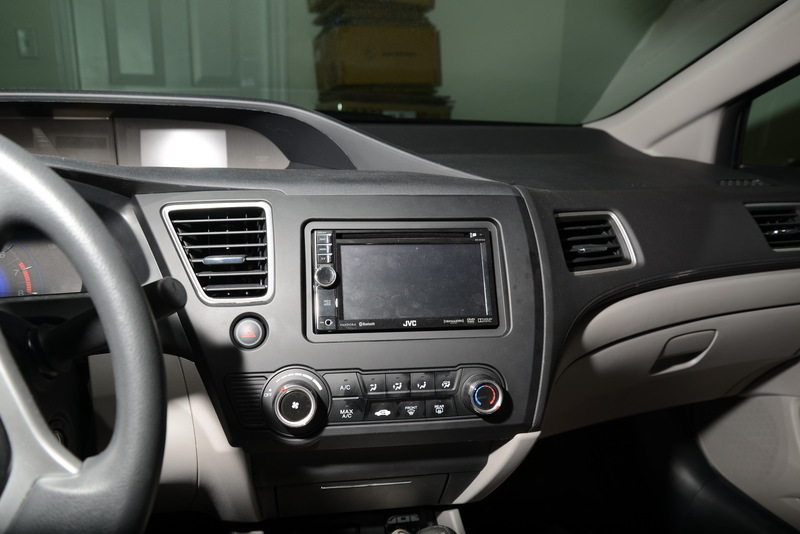 The system starts with a JVC KW NT-310 GPS Navigation deck which is one of a very limited number of car audio head units that can play FLAC. 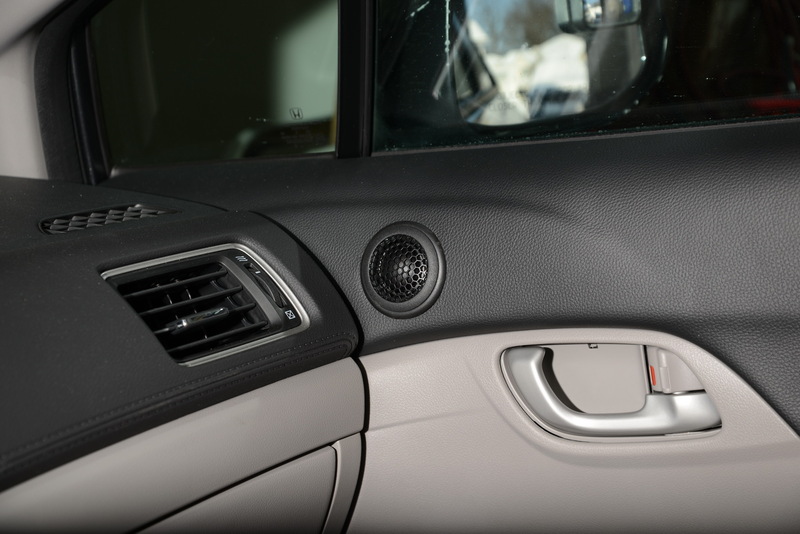 In general, the car audio crowed is not particularly interested in sound quality otherwise more decks would be capable of playing lossless formats. I believe that for the most part, the car audio market is about loud and boomy! Three miniDSP 2x4’s were used for crossovers and EQ for the entire system. There are no passive crossovers. A necessary accessory for these processors is the DC isolator. This serves as an amplifier turn on delay that first starts the DSP and then the amplifier. The original amplifiers for the front door and rear deck speakers were the Memphis SA 4.50 “Special Application” class D amplifiers. I have to say, “Special Application” is right, it would take a pretty special application for it to be ok that the amplifiers will not remain on while playing at low volume. An unfortunate design flaw which inappropriately used a music sense circuit to keep the digital chipset off whenever it determined no signal was present resulted in these amplifiers having to be removed. These were replaced by a JL Audio XD800 8v2 8-ch amplifier. I’m not convinced the JL sounds as good as the SA4.50 but it’s pretty close and it doesn’t turn itself off when it thinks the volume is too low! Although I returned the original SA4.50 amplifiers I later found one new in box on ebay for just $96. At that price I figured it was worth it just to take it apart and figure out what was wrong with it. I have posted the fix for the amplfier here. 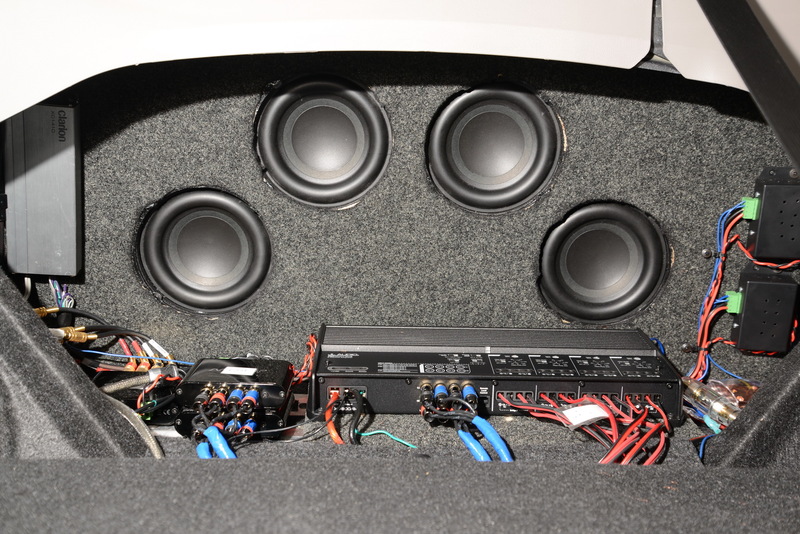 For the front door speakers the Seas Prestige MCA15RCY 5.5 Midrange was used along with the Seas Prestige 27TFFNC. 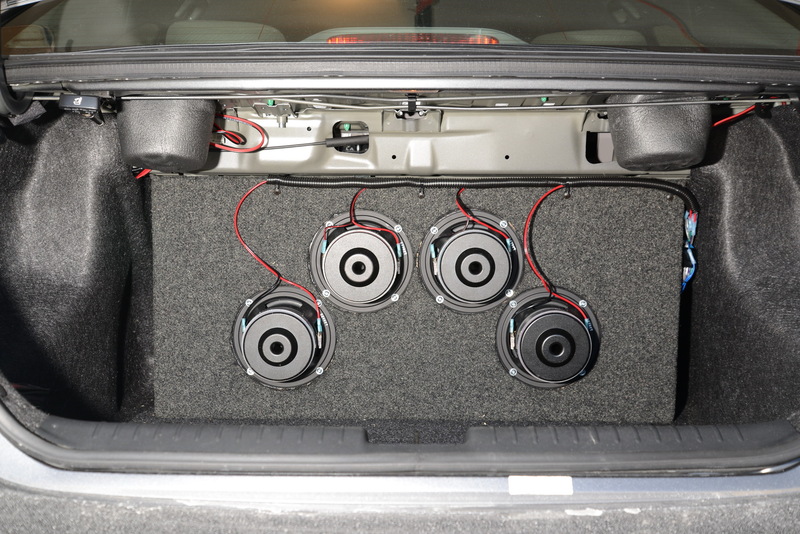 For the rear deck speakers a modified Memphis 15MCS6A 6.5" component system was used. These can be setup with the included tweeters mounted inside the 6.5” mid-bass drivers much like a coax or they can be mounted externally. I chose not to use the included tweeters but instead to replace them with the Seas Prestige 27TFFNC. Using a small spacer and a single screw it was possible to mount this tweeter inside the Memphis mid-bass driver in place of the original. This is the same Seas tweeter used in the front door panels. The subwoofers are the Tang-Band W6-1139SIF 6-1/2” Paper cone subwoofer. 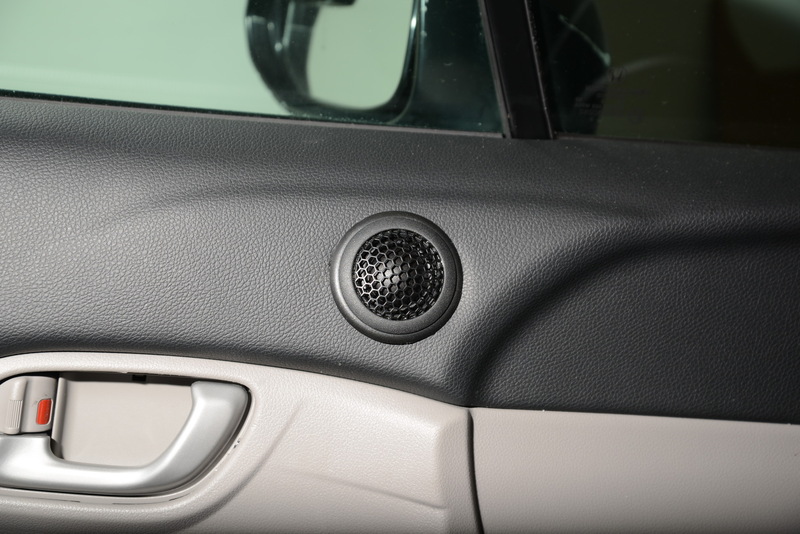 Four of these are mounted on a panel installed in the trunk behind the back seat. These are driven by a Clarion XC1410 4-ch amplifier. This might not seem like much power for subwoofers but I’m not looking for big boomy bass! The four channels of this amplifier each driving a 6.5” sub is plenty! The system was installed by Electronic Warehouse and was originally very neat. I installed the JL amplifier myself so it’s not quite as neat as it was originally. No photos were taken during the install process but here are a few of the now finished product. The 8-ch JL-Audio amplifier has been removed and replaced by two modified Memphis Audio SA4.50 4-ch amplifiers. The Memphis amplifiers definitely sound better than the JL-Audio, they are quieter, cleaner, and just generally sound better. It's unfortunate that it is necessary to take these apart and modify them to make them play correctly but once this is done, they are definitely the better amplifier.